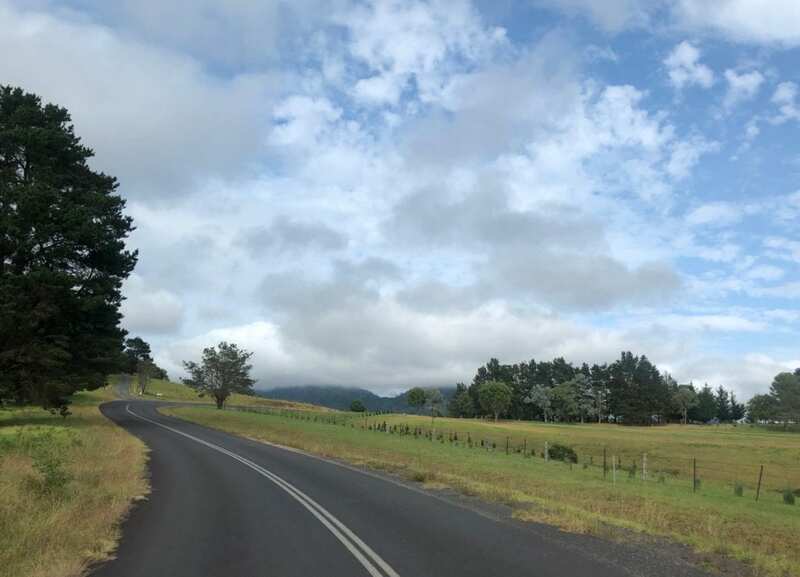 We were cruising down the South Coast of New South Wales, vaguely making our way to Tumut on the Southern Tablelands. 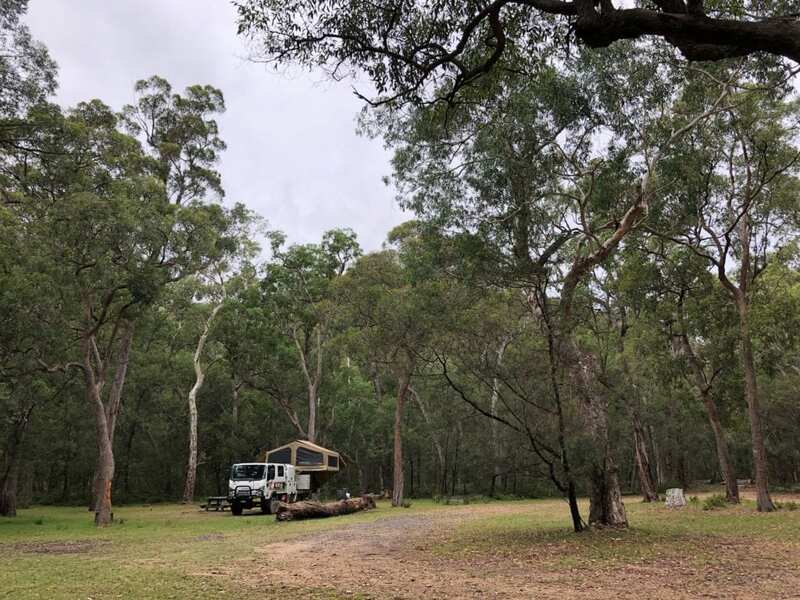 We were looking for national park camping and noticed Wadbilliga National Park. Driving through dairy country near Cobargo on the way to Wadbilliga National Park. So we decided to check it out. And we’re glad we did! 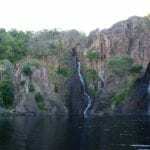 Wadbilliga National Park is west of Cobargo on the NSW South Coast. It encompasses coastal country into the ranges then up and over the ranges into the Southern Tablelands. It stretches roughly 80km north-south, almost to the Snowy Mountains Highway in the south. 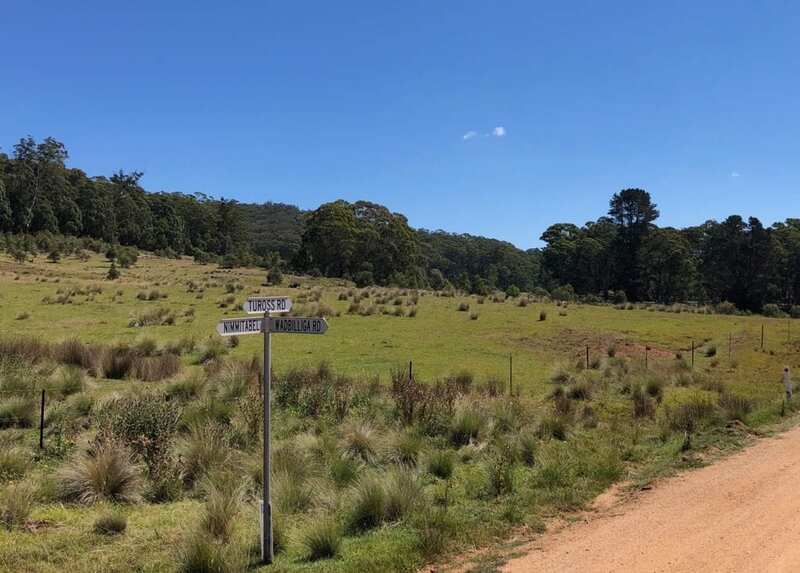 Here it joins the South-East Forests National Park, which is west of Eden NSW. At the northern end, Wadbilliga National Park joins onto Deua National Park. You can access the drive from Nimmitabel on the Southern Tablelands or Cobargo on the coast. For more details, see the map below. What Is This Road Trip? 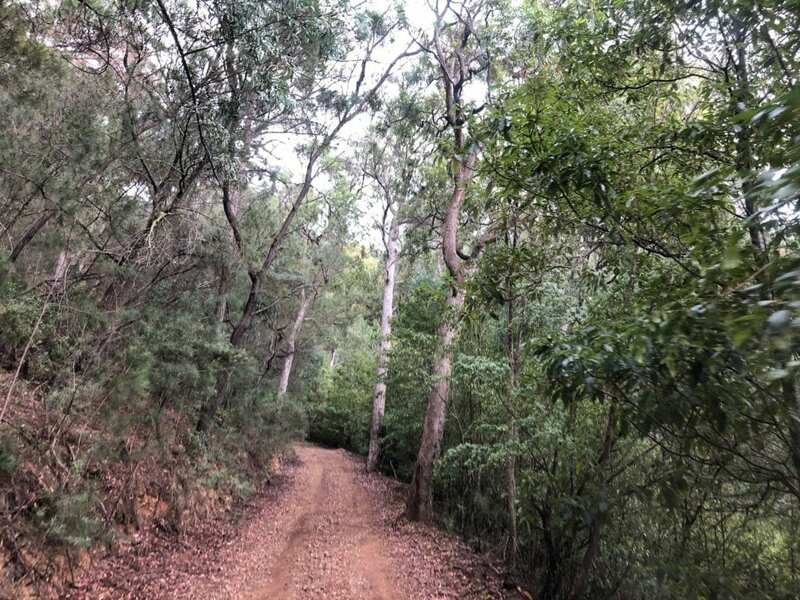 A road (track) runs through the park from Cobargo, west to Tuross Road on top of the mountain range. It starts off as Wandella Road at Cobargo, then you turn left onto Yowrie Road. At some point Yowrie Road becomes Bourkes Road and this leads you into the national park. Once you reach the Wadbilliga River, turn left onto Wadbilliga Road. There’s no access straight ahead, as this is private property. From here on, simply follow Wadbilliga Road. Sounds confusing, but it’s not. Follow the signs to Wadbilliga National Park and you can’t go wrong! 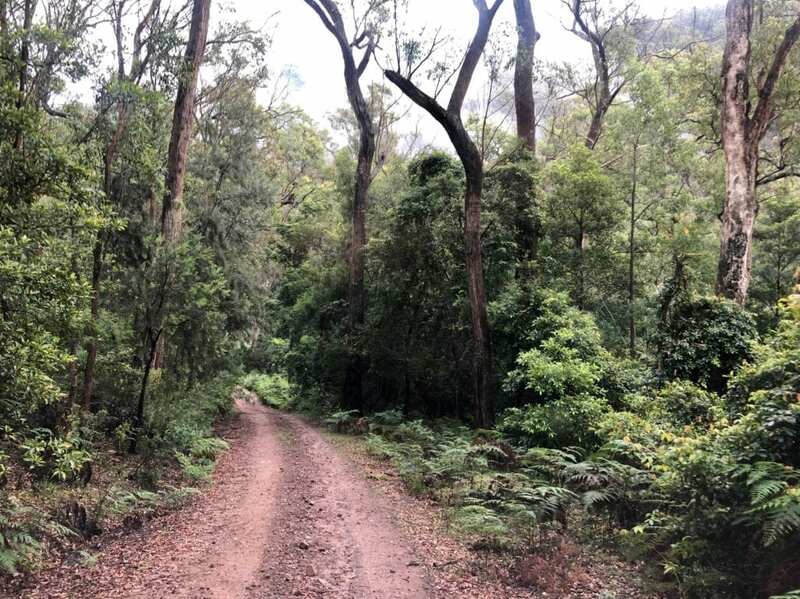 National Parks say the road into Wadbilliga River picnic area is a 2WD track. We disagree. Yes, you could drive a high clearance 2WD to the picnic area with caution. But there are some steep pinches and the track can be pretty rocky. 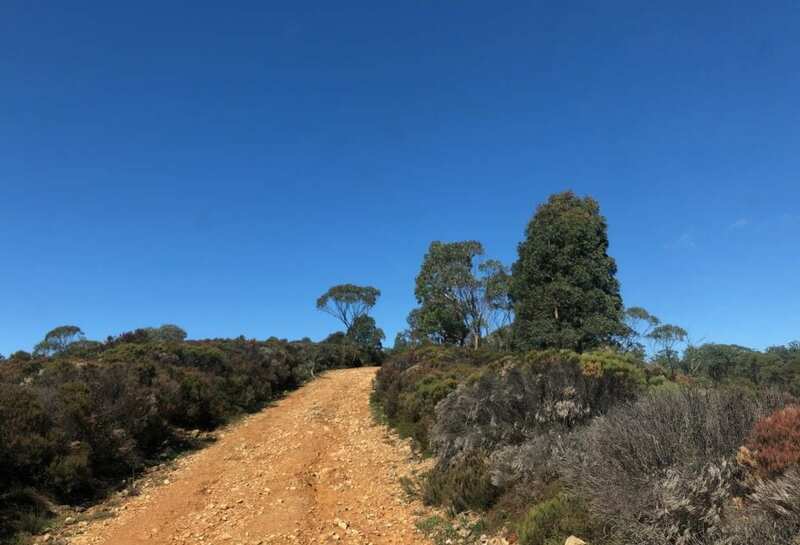 This is not really a 2WD road, contrary to the advice given by NSW National Parks. Be prepared with a spare tyre if you’re considering driving to the picnic area in a 2WD. And west of the picnic area, Wadbilliga Road is a bush fire trail. There’s nothing extreme, but you’ll encounter some steep sections, waterholes and washed out rocky sections. This is definitely 4WD country. The terrain varies enormously. Leaving Cobargo, you’re in a large valley with the green rolling hills of dairy farms. Once in Wadbilliga National Park, you’ll start to see pockets of sub-tropical rainforest. The mountains close in and you feel the cool and damp rainforest environment asserting its dominance. 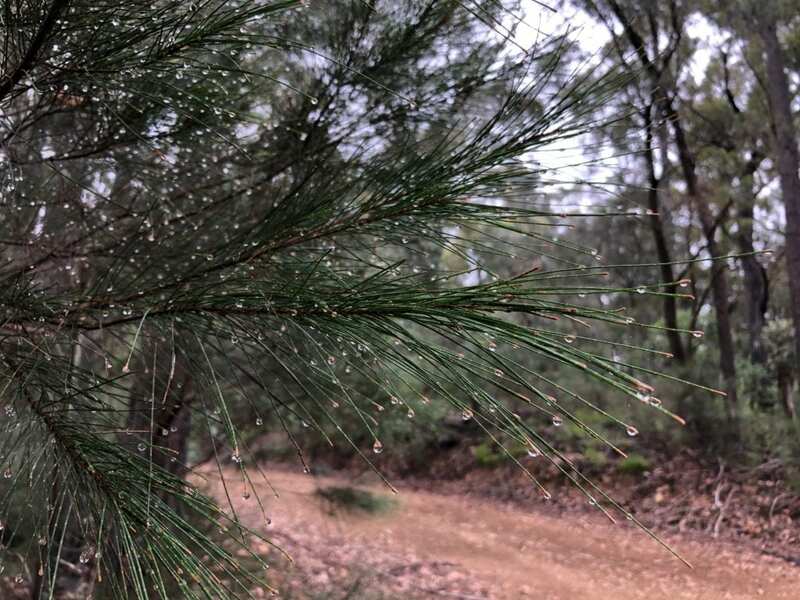 Thousands of tiny dew drops on the end of each pine needle. 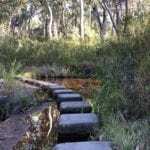 Then you reach the strange riverbed of Wadbilliga River and follow this for a while until reaching Lake Creek campground. 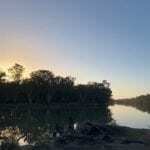 What’s strange about Wadbilliga River, I hear you ask? Well, the riverbed is covered in large riverstones. We’re not talking fist-sized riverstones. No, they’re great lumps of rock covering the riverbed. In between, reefs of granite poke out of the crystal-clear water. And surprisingly we didn’t see much sand… mostly just a bed of riverstones. Quite strange and strikingly scenic. On the western bank of Lake Creek is the campground. There’s heaps of great spots to camp. You’ll find a drop toilet and several fire pits. We were one of three groups of campers the night we stayed. You have room to keep out of each other’s way and enjoy the peace and quiet. A screeching gang-gang cockatoo welcomed us. They sound like a muted black cockatoo, and their striking grey feathers make them difficult to spot. We had some light drizzle late afternoon. Then at about 8pm… a sudden boom bounced off the mountains around us. A thunderstorm brought really heavy rain and a fantastic lightshow. Watching the imposing mountains being backlit by the lightning was something I’ll never forget. And the echoes of the thunder were intimidating to say the least! The rain pelted down for several hours. By morning the rain had gone. We decided to press on and see whether the track was still okay. As it turned out, being granite country most of the water had soaked into the coarse soil. So the track was hardly affected. 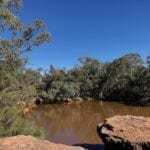 About 5 or 6km past Lake Creek campground, you come to Wadbilliga River picnic area. Just before this though, is a magical carpet of the greenest ferns imaginable. The track weaves through this wonderland towards the river crossing. If you can drag your eyes away from this spectacle, you’ll see cliff walls of solid granite off to the right. The scenery here is mind-blowing! 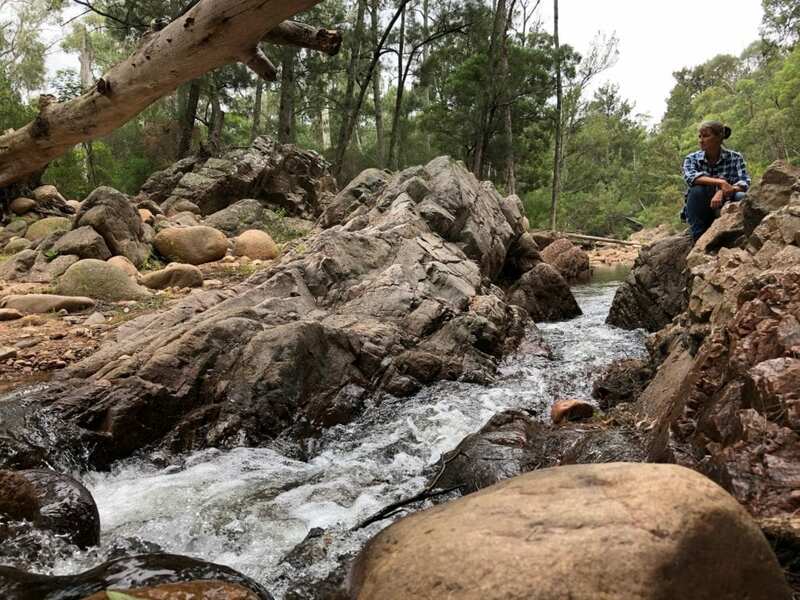 Then just when you thought it couldn’t get any better, you cross a narrow causeway over the pristine Wadbilliga Creek. Stop at the picnic area and take in the scenery… it’s unbelievable. From here on, the track is definitely 4WD only. After some more beautiful fern-covered flats along the river, the track heads up. While not particularly steep, it hugs the side of a near-vertical mountain and slowly winds up. So if you’re scared of heights, don’t look down! The mountain you’re clinging to drops down into the Wadbilliga River. An equally steep mountain on the other side is covered in gigantic granite cliff faces, with mist shrouding the top of the opposing mountain. I told you this place was spectacular! Pockets of fern trees cling to the shady gullies up the mountain. In fact on one bend, we all but disappeared under the large fronds. Fallen trees litter the track, so chances are you’ll come across one. Luckily they had been cut before we found them. A sign saying “Conways Gap” finally appeared through the windscreen. This is pretty well the end of the sub-tropical rainforest. A short climb later and you’re up onto the Tablelands. Once on top, the trees thin out and stunted sub-alpine gums cover the mountains. Thick heathlands cover bare hills… you’re into the cold country of the Southern Highlands. Heathlands and a rocky track in the sub-alpine environment of the tablelands. Even up here, the odd protected gully is covered in green carpets of ferns. The track is rocky up here, washed out from the heavy rain we had the night before. After a while you reach the western end of Wadbilliga National Park. A short drive takes you through private property, across the Tuross River and out onto Tuross Road. Make sure you stay on the track, as these landowners have generously allowed public access through their property. At the turnoff on Tuross Road. Your delightful journey through the national park is over. This road trip has everything… green coastal valleys, sub-tropical rainforest, wild mountain country, beautiful rivers and sub-alpine heathland. Take your camera and allow plenty of time to take in the magnificent scenery. A drive to remember. 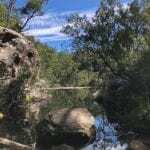 Wadbilliga National Park is on Yuin Country.